The gold scorpion is native to western Africa and the Middle East. It burrows in sandy soils in rocky areas. It can range in size from 2 to 3.5 inches and is a quick moving, small, chunky scorpion. It has a shiny straw or golden yellow appearance with short rounded pincers. 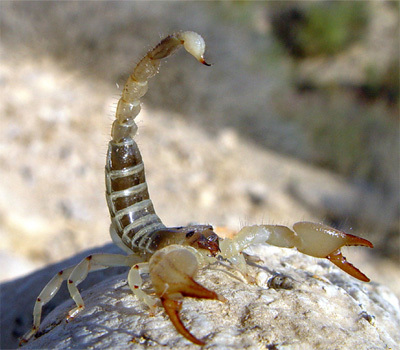 Many species of gold scorpions will sting if confronted and grab with their pincers. Their sting is quite painful and some of these species produce more severe symptoms. Because of their disposition, these scorpions should only be kept by an experienced collector. A ten gallon terrarium with an under tank heat pad is required. Sand or a mixture of Eco-earth and sand three to four inches deep makes a suitable substrate. The habitat should also have a shallow water dish and small flat rocks, cork bark, or logs to create hide areas. Multiple gold scorpions can be in the same habitat as long as they are well fed and enough hiding areas and places to burrow are supplied. Gut loaded crickets and other insects will make up the diet.